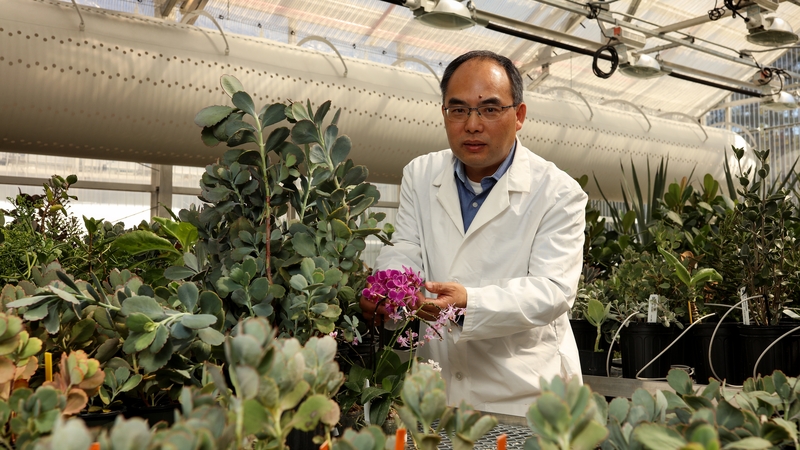 OAK RIDGE, Tenn., Dec.1, 2017 – Scientists at the Department of Energy’s Oak Ridge National Laboratory have identified a common set of genes that enable different drought-resistant plants to survive in semi-arid conditions, which could play a significant role in bioengineering and creating energy crops that are tolerant to water deficits. Plants thrive in drylands by keeping their stomata, or pores, shut during the day to conserve water and open at night to collect carbon dioxide. This form of photosynthesis, known as crassulacean acid metabolism or CAM, has evolved over millions of years, building water-saving characteristics in plants such as Kalanchoë, orchid and pineapple. Scientists are studying a variety of drought-resistant plants to unlock the mystery of CAM photosynthesis. For this work, the ORNL-led team sequenced the genome of Kalanchoë fedtschenkoi, an emerging model for CAM genomics research because of its relatively small genome and amenability to genetic modification. 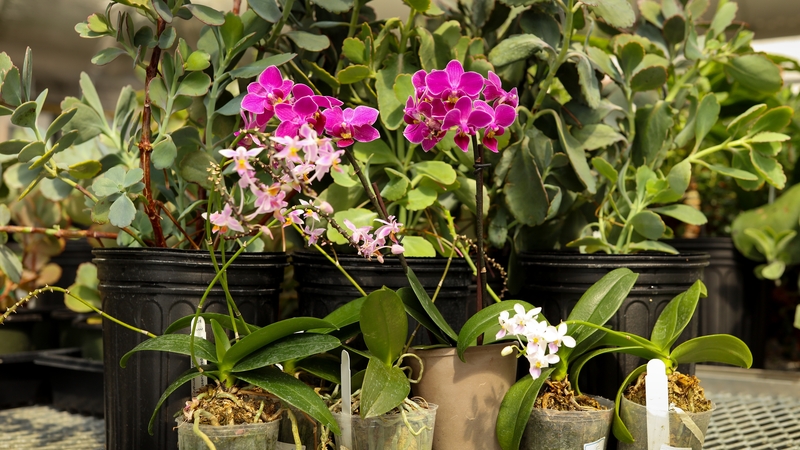 The team investigated and compared the genomes of K. fedtschenkoi, Phalaenopsis equestris (orchid) and Ananas comosus (pineapple) using ORNL’s Titan supercomputer. “It is widely accepted that some unrelated plants exhibit similar characteristics under similar environmental conditions, a process known as convergent evolution,” Yang said. They identified 60 genes that exhibited convergent evolution in CAM species, including convergent daytime and nighttime gene expression changes in 54 genes, as well as protein sequence convergence in six genes. In particular, the team discovered a novel variant of phosphoenolpyruvate carboxylase, or PEPC. PEPC is an important “worker” enzyme responsible for the nighttime fixation of carbon dioxide into malic acid. Malic acid is then converted back to carbon dioxide for photosynthesis during the day. 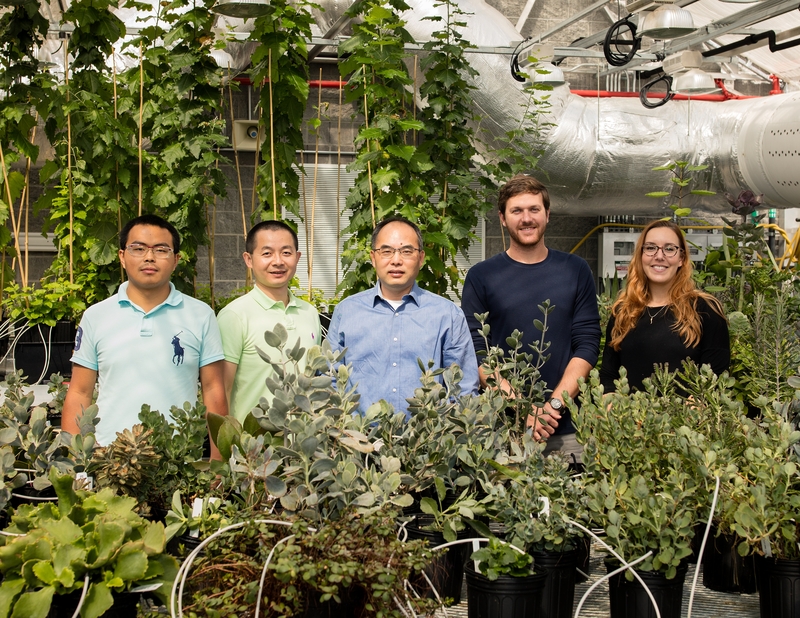 “These convergent changes in gene expression and protein sequences could be introduced into plants that rely on traditional photosynthesis, accelerating their evolution to become more water-use efficient,” said Yang. The team published their findings in Nature Communications. Crop production is the world’s largest consumer of freshwater. Availability of clean water resources is shrinking because of urbanization, human population growth and changes in climate, which presents a challenge to optimal growing environments. To address this concern, engineering CAM photosynthesis into food and energy crops could reduce agricultural water use and boost crops’ resilience when the water supply is less than desirable. The study titled, “The Kalanchoë genome provides insights into convergent evolution and building blocks of crassulacean acid metabolism,” included ORNL coauthors Xiaohan Yang, Rongbin Hu, Hengfu Yin, Degao Liu, Deborah Weighill, Robert Moseley, Sara Jawdy, Zhihao Zhang, Meng Xie, Paul Abraham, Ritesh Mewalal, Kaitlin Palla, Henrique Cestari De Paoli, Anne Borland, Jin-Gui Chen, Wellington Muchero, Daniel Jacobson, Timothy Tschaplinski, Robert Hettich and Jerry Tuskan. The study also included collaborators from University of Tennessee, HudsonAlpha Institute for Biotechnology, the DOE Joint Genome Institute, Fujian Agriculture and Forestry University, University of Nevada, University of Georgia, Northern Illinois University, University of Liverpool, University of Oxford, University of Illinois at Urbana-Champaign, Pacific Biosciences, Inc., Michigan State University, Newcastle University and Smithsonian Tropical Research Institute. The research was funded by DOE’s Office of Science (Biological and Environmental Research, Genomic Science Program) and ORNL’s Laboratory Directed Research and Development program. The work also used resources of the Compute and Data Environment for Science at ORNL, a fully integrated infrastructure offering scalable computing, software support and high-performance cloud storage services and the Oak Ridge Leadership Computing Facility, which is a DOE Office of Science User Facility.